GlaxoSmithKline now has approval for its closed triple therapy for chronic obstructive pulmonary disorder (COPD) on both sides of the Atlantic after getting the nod from the EMA. The EU regulator cleared Trelegy (fluticasone furoate/umeclidinium/vilanterol) - considered to be the most important new product in the company’s ailing respiratory franchise - as a maintenance treatment in adults with moderate to severe COPD who are not adequately treated by the combination of an inhaled corticosteroid (ICS) and a long-acting beta agonist (LABA). The same indication was approved by the FDA in September, and makes Trelegy the first drug on the market to combine an ICS, LABA and long-acting muscarinic receptor antagonist (LAMA) in a single inhaler dosed just once a day. 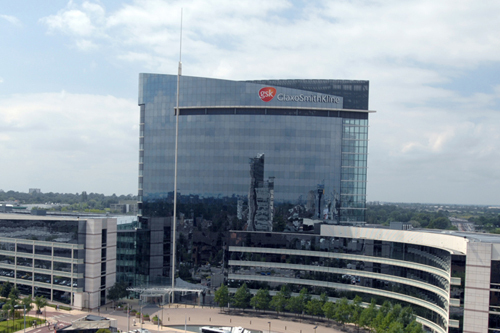 GSK said in a statement that it expects to launch the new product into its first EU markets before the end of the year. GSK has a lot riding on Trelegy as it tries to grow its respiratory business, which has been hit by patent expiries for COPD blockbuster Seretide/Advair (salmeterol and fluticasone propionate) - an ICS/LABA combination that at one point brought in $7bn a year for the company but has seen sales slump in the last couple of years, falling 13% to £2.34bn in the first nine months of this year. GSK has been bringing other new COPD therapies to market - including Advair successor Breo/Relvar (fluticasone furoate and vilanterol) and Anoro (umeclidinium bromide and vilanterol) - but with greater competition in the COPD sector from the likes of AstraZeneca, Novartis and Boehringer Ingelheim, which have all launched their own fixed-dose combination products, analysts reckon Trelegy represents its biggest commercial opportunity. Recently-published market research from GlobalData suggests Trelegy and a triple-combination in development at AZ could together reach $3.1bn in sales by 2025, accounting for a sizeable chunk of the $14.1bn overall COPD market in that year in nine key markets - the US, France, Germany, Italy, Spain, the UK, Japan, and Australia. GSK could also have a winner on its hands if severe asthma therapy Nucala (mepolizumab) - an IL-5 inhibitor - also gets regulatory approval in COPD. As with the triple, GSK is facing off against AZ in this category as the latter’s Fasenra (benralizumab) IL-5 blocker - recently approved by the FDA - is also in testing for COPD.